The world today is faced with great challenges to produce adequate food, feed and industrial products for the globe's 6 billion people. Nearly 200 new residents are added to our planet every minute and approximately 80 million every year. Furthermore, the area of arable land available to feed this population is shrinking and is subject to significant loss of topsoil and ground-water. Future population growth will continue, most noticeably in developing nations. Closely linked with this population explosion and subsequent increasing poverty and demand for food is the potential decline in quality of the environment in which food is grown and produced. The complex triangle of poverty has been described as the assembly of environmental decline, rapid population growth and related problems that hinder development. In developed countries, urban sprawl has covered some of the best arable land, and poor land management has slowly degraded the quality of the agricultural land. All of these negative trends will be compounded by the predicted climatic change resulting from global warming. Crop growth and yield potential and distribution of marketable products are limited in many regions of the world by a variety of environmental abiotic and biotic stress factors and challenges. Consequently, there is a substantial deficit between potential and realized crop yields. There are about 14 Gha (x 109) of land in the world, but only about 1.4 Gha are arable, non-stressed crop land. Of the remaining area, 2.9 Gha are under mineral stress (1.0 Gha salt stress), 3.7 Gha endure drought stress, 1.6 Gha are limited by excess water, 3.2 Gha have very shallow soil profiles, and 2.0 Gha are subject to permanent freezing. The total arable and potentially arable land, which could produce reasonable crop harvest, is estimated at about 3.2 Gha (Christiansen, 1982). Farmers, people in agribusiness and consumers in recent history have looked to improvements and new discoveries in cultural practices (irrigation, fertilizers, and pesticides), breeding and other agricultural technologies to increase yield potential of crops, maintain yield stability in the face of environmental stresses and provide other desirable characteristics to improve food and feed. The history of agricultural development and improvement in crop production can be characterized as an evolution through four distinct eras: the labour era, the mechanical era, the chemical era, and the present biotech-nological era. Advances in plant breeding have served as a backbone throughout this evolution. The first improvements in resistance or tolerance to stress involved determining the genetics of inheritance of desirable traits. These efforts have been generally successful in providing resistance to pathogens and insects and in developing many desirable agronomic characteristics. However, many of the successes have been overshadowed by the 8- to 12-year process of conventional cross-breeding and the likelihood of these traits being linked to inheritance of non-desirable traits. Molecular genetic mapping of the plant genome has provided RFLP (restriction fragment length polymorphism) and RAPD (rapid amplified polymorphic DNA) markers which are sufficiently closely linked to known resistance genes to make their isolation, sequencing and transfer likely in the near future. Biotechnology, or production of transgenic plants with novel genes imparting stress tolerance or resistance, offers possibilities of a quantum leap in the ability to confer or improve stress tolerance in crop plants and, in combination with conventional breeding techniques, provide new solutions to some of these 'old problems'. 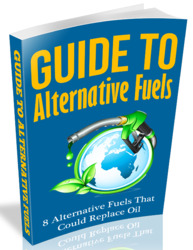 The development and delivery of these technologies give considerable optimism for the future. Agricultural biotechnology will allow increases in crop yields and maintenance of yield stability without increasing land usage. Furthermore, farmers can exert some degree of control over weeds, insects and disease-causing pathogens that threaten crop production and distribution. Most importantly, farmers may be provided with the flexibility to plant crops that have been genetically altered to tolerate and grow in 'less than ideal' soils or weather conditions and in varied geographical locations. There are several obvious opportunities for improving crop performance and productivity through optimization of cultural practices, plant breeding, and new developments in biotechnology. Certainly, it is quite clear that one important contribution of plant genetic engineering will be to improve stress-tolerance traits in crops of commercial value. The opportunities for enhancing crop performance under stress conditions lie in identifying key traits that require enhancement, stress-relieving candidate genes and the appropriate plant stage of development where enhancement should occur. This process of gene identification and gene expression patterns associated with quantitative genetic traits in crops is becoming more attractive and promising as the scientific community develops and gains access to large-scale genomics resources such as EST (expressed sequence tag) databases, high-throughput gene expression profiling technologies and genomic mapping information. This chapter focuses on key examples from recent publications in which stress tolerance of plants has been improved through gene transfer, or at least identifies cases in which genetic engineering of plants has shed some light on the mechanisms by which stress tolerance or resistance is conferred. To improve the ability of crops to cope with existing and new stresses, it is imperative to develop a basic understanding of the mechanisms and processes by which plants respond to stress. 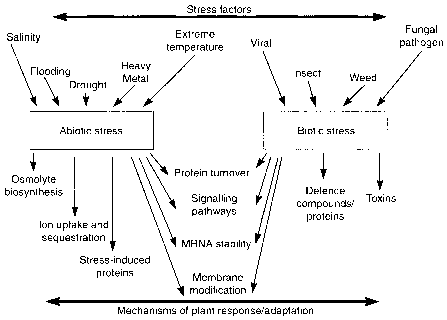 Mechanisms of plant response or adaptation and their key processes that are affected by environmental stresses are summarized in Fig. 20.1. This diagram illustrates that many components that are part of the initial stress perception and response could be similar. If multiple stress perception and response mechanisms are similar, this makes certain transgenic approaches very powerful - namely, those in which manipulations of one component could confer tolerance or resistance to several environmental stresses. This chapter focuses mainly on advances in biotechnology to improve plant response to abiotic stresses.